‘Fleeing From Darkness’ is an interactive web application that explores the possibilities for replicating and engaging users in the practice of Neon Sign Tubebending. The project is currently in the wireframe state, with drawings for potentially interactive processes. This project reflects an attempt to more deeply identify embodied knowledge in craftsmanship in order to engage in dialogue about the presentation and reproduction of such knowledge. ‘Fleeing From Darkness’ seeks to explore the possibilities for identifying and replicating certain components of intangible, embodied knowledge as a craft that reflects the heritage of 20th Century urban communities. However, the ability to identify and reproduce aspects of embodied, intangible knowledge is very difficult to do. This knowledge is often more easily explored and portrayed as the cultural significance and history of a particular practice. While I have attempted to replicate certain processes of tubebending in ways that provide some insight into the skills required, it is simply not possible to fully attain this form of knowledge without the live, practical process of learning, trial and error. This project illustrates steps in the tubebending process with the ability to design your own sign through a variety of interactive applets. The application steps the user through 5 steps: Design the sign blueprint, Bend the glass, Bombard and add the appropriate gas, connect the sign to current to be Burnin In, and finally apply paint to Blockin Out unneeded sections of tube light. 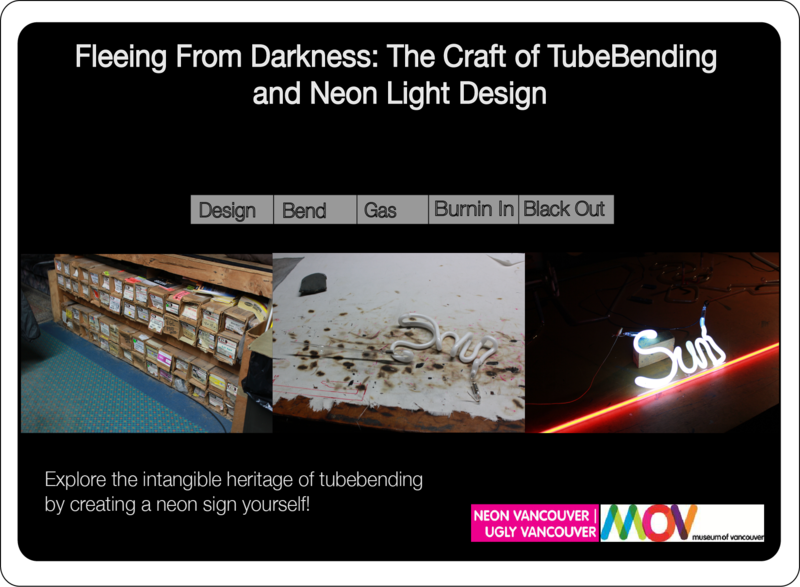 Carlson, K., Hennessey, K., Schiphorst, T. (2012) ‘Fleeing from Darkness: The Craft of Tubebending and Neon Light Design’, Public Symposium on New Media and the Museum: Illuminating Vancouver’s Neon Heritage.